Let’s begin with a super simple definition of the bass. The bass is a low pitched stringed instrument played primarily with the fingers. Wow, perhaps that’s a bit too simple, let’s take a closer look at this essential instrument. We’ll start with the Double Bass. The double bass, also called the string bass, upright bass, bass fiddle, bass violin, contrabass, stand-up bass or doghouse bass, is the largest and lowest-pitched bowed string instrument in the Western classical music symphony orchestra. It traditionally has four strings usually tuned E, A, D and G, from the thick string 4 to the thin string 1. This method of tuning is known as standard tuning. The double bass is about six feet tall from scroll to endpin and is typically constructed from several types of wood, including maple for the back, spruce for the top, and ebony for the fingerboard. A person who plays the double bass is usually referred to as a bassist. As was said, the double bass is an integral member of the string section of the modern symphony orchestra, however, it is also used in other genres such as jazz, blues, rock, rockabilly, country, bluegrass, tango and many types of folk music. While the double bass is nearly identical in construction to other violin family instruments, it also embodies features found in the older viol family. 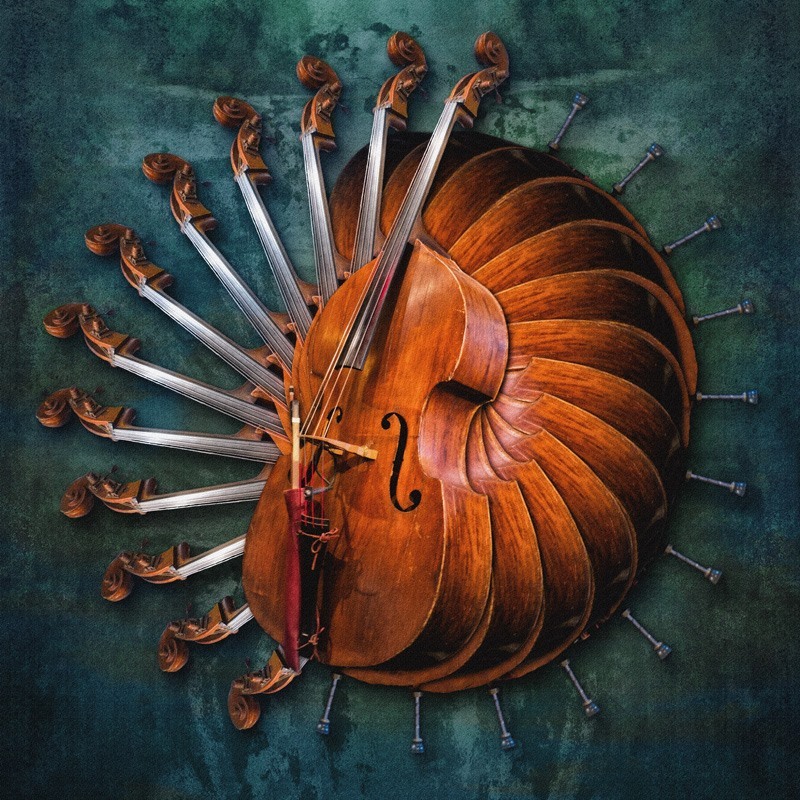 And even though it is traditionally aligned with the violin family, it is uncertain whether the instrument is a descendant of the viola da gamba or of the violin. Like many other orchestral string instruments, the double bass is played either with a bow (arco) or by plucking the strings (pizzicato) with the fingers. In classical orchestral music, both arco and pizzicato are used. In jazz, pizzicato is the norm, except for some solos and occasional written parts that call for bowing. When the double bass is used in other genres such as blues and rockabilly, the bass is plucked. When playing the double bass, the bassist either stands or sits on a high stool and leans the instrument against their body with the bass turned slightly inwards in order to more easily reach the strings. The double bass has sloped tapered shoulders, which separates it from the other members of the violin family. This narrower top area of the double bass facilitates playing the strings in higher registers. The double bass is a transposing instrument and sounds one octave lower than notated in the bass clef. This avoids excessive higher ledger lines. 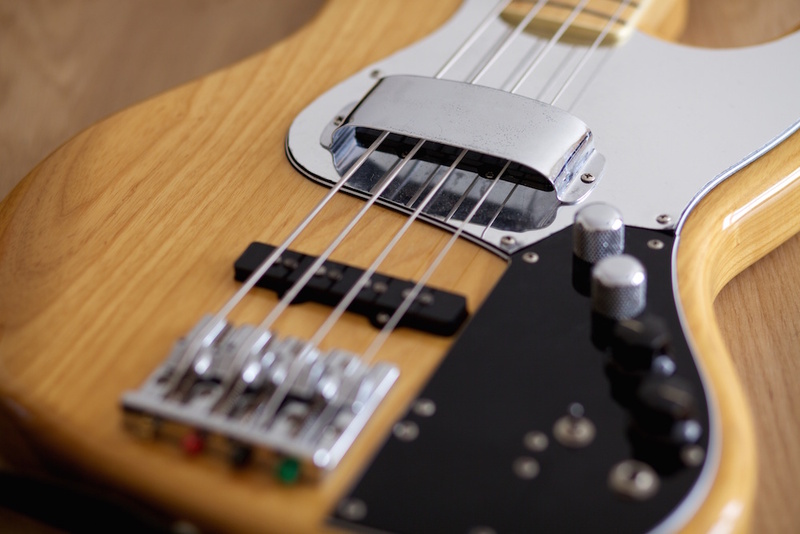 The electric bass is similar in appearance and construction to an electric guitar, but with a longer neck and scale length, and four, five, six, or eight strings. The four-string electric bass is still the most common electric bass and is usually tuned the same as the double bass: E, A, D, and G. This tuning corresponds to the strings 6, 5, 4 and 3 of a guitar, one octave lower. The electric bass may be played with a plectrum (pick), or with the fingers or thumb so as to slap, pop, tap or thump. Like the double bass, the electric bass guitar is a transposing instrument, which sounds one octave higher than it is notated in the bass clef. The electric bass guitar, which generally has a solid wood body and therefore very little resonance, is plugged into an amplifier and speaker(s) to supply dynamic volume. 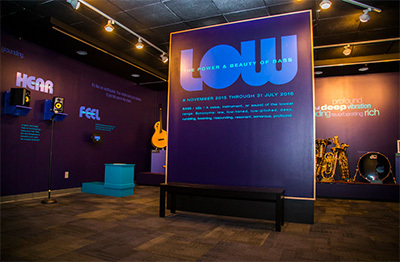 Since the 1960s, the bass guitar has largely replaced the double bass in most styles of music including rock, metal, pop, fusion, Latin, funk, punk, country, reggae, blues, and jazz. While the types of bass lines vary widely from one style of music to the next, the function of the bass, which is to anchor the harmonic framework and keep the beat, is the same in most types of music. 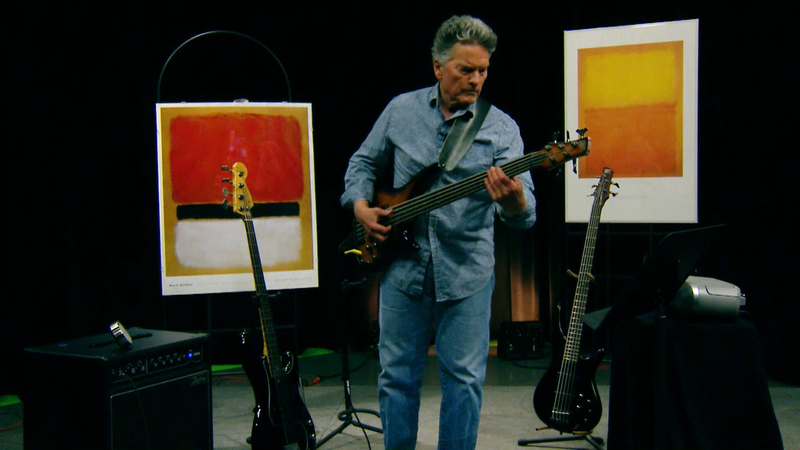 It should be noted that in the 1970s, the fretless electric bass was instrumental in the development of new approaches to the bass, such as harmonics and glissando (slide). Now, here’s something strange. As was said earlier, a person who plays the double bass is referred to as a bassist, but in contrast, a person who plays the electric bass is usually referred to as a bass player. However, I like to avoid this comparative bias and consider both as musicians who play the bass! The following is an incomplete alphabetical listing of influential rock, metal, pop, fusion, Latin, funk, punk, country, reggae, blues, and jazz musicians of both double bass and electric bass. As was said earlier, the above list is incomplete. So, if I left out someone you think should be on this list, don’t hesitate to let me know. ’til next time, have some double-electric-bass playing fun… I’ll be listening! 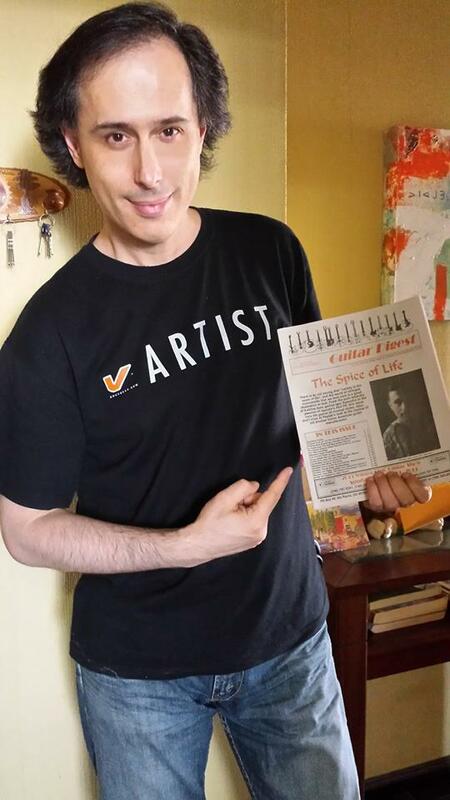 Here is Igor Saavedra on the cover of the 2014 Volume 29 Number 3 edition of Guitar Digest magazine which features the following Mike Overly interview ~ Enjoy! Mike Overly: Ancient Babylonians had bass-guitar-like instruments, and ever since then the bass has been evolving from acoustic to electric to electronic. Share with us your understanding of this evolution and the music it has inspired you to play. Igor Saavedra: This is true. In my opinion, the first bass instrument was the human voice. Sung by some tall and skinny Earthling from one hundred thousand years ago who was able to sing very low sounds rhythmically. Then later, instruments were created to accomplish something similar. I think the vibrations of low bass frequencies carry much more energy than higher frequencies. Lower frequencies make us physically vibrate, they move our guts, our chest, our hair and even our skin. I feel that the low bass frequencies are connected with the physical aspects of our being much more than the higher ethereal frequencies. I’m quite sure these are some of the reasons why I love and am attracted to the bass. I truly feel it resonates from within me. MO: We all begin by imitating, to put it simply, do you remember a time when you moved from imitation to influence? IS: Imitating is the first impulse of anybody who is attracted to someone’s performance. Imitation has something to do with self-confidence and matureness. The less mature the observer is, the more imitation will be triggered. In contrast, influence is the elixir extracted from the initial imitation process. In other words, we can go directly from experiencing the phenomenon to extracting an influence from it. The sadness of all this is when somebody doesn’t realize he’s imitating and remains doing so for the rest of his life. He leaves his own evolution and creativity undeveloped. That being said, I really don’t recall any moment of my ongoing evolution as a music student where I imitated somebody. I think that one of the things that helped prevented me from doing so was the fact that I started music so late in life. MO: I am sure our readers would like to know when you started playing bass, was it your first instrument, and was learning to play it difficult for you? IS: It was definitely my first instrument, and as I said, I started playing late in life. Many people think I’m joking when I tell them I grabbed a bass for the first time when I was 22 years old. In fact before that great day, music was not part of my life at all. I was in 5th grade studying to become a PE teacher and I was already a Kung-Fu instructor planning to do higher degrees in China at that time. For some unknown reason, mostly considering that I’ve always been a self-taught musician, learning the instrument was really easy for me. There was a deep connection from the very first day which remains strong to this day. There were many reasons which lead me to be a self-taught musician. Of course that doesn’t mean that I thought there was no one who had something to teach me. It’s just that it didn’t happen. Luckily, due to my Martial Arts and sports background, I was very self-disciplined which, in my opinion, is the main requirement for any musician, whether self-taught or not. MO: Having grown up in Chile, we wonder if “blues” has any influence on your music, or, do you feel that it is just an American element? IS: The world has gotten much smaller since I was starting to play bass. In South America we listen to blues as much as we listen to our own music. 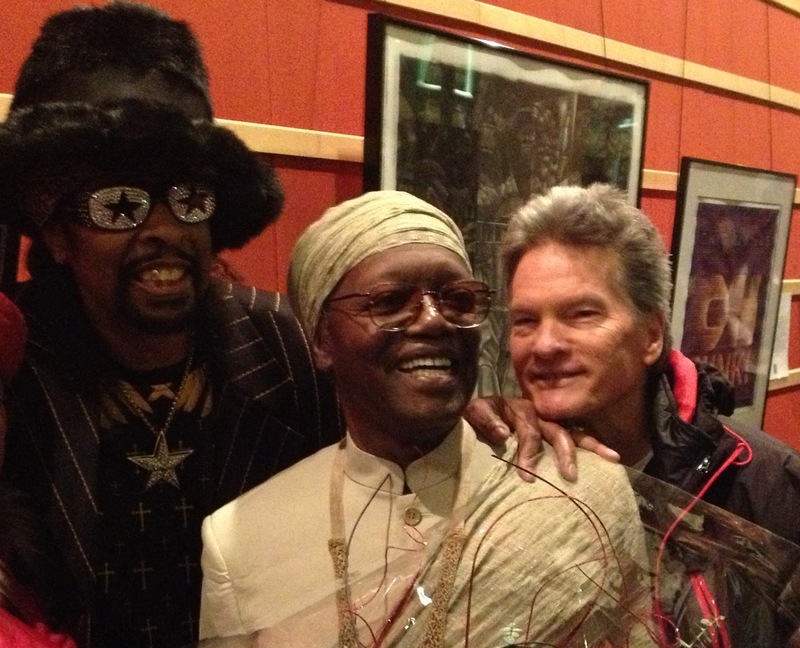 So yes, blues influences our music. MO: Share with us your feelings toward maintaining cohesion among players in a band, and by extension, in business relations. IS: The answer to this question could be very long, so, I’ll go straight to the point. I think the most important aspects in a group environment; no matter if it’s related with a music band, a football team, a husband-wife relation or a business partnership; is ethics and morals. Having a strong sense of responsibility is without a doubt the main value a musician has to have in order to be able to relate effectively with other human beings. MO: Do you teach bass either one-on-one, or online, and if so, what motivates the topic of your lessons? IS: Yes I do. I teach private and online lessons. The main topic of my lessons is to have the student understand what Bass is about, what its essence is, and what skills the student needs to develop in order to be a great bassist. I tailor the lessons accordingly to the students ability and interest and I always center my attention on developing rhythmic aspects first. MO: Do you remember your first music or method book? If so, was it classical, jazz or music theory or something else? IS: I remember The Evolving Bassist by Rufus Reid which is a jazz book. The Classical Double Bass book by Isaia Bille. And a great, basic music book written by Roger Evans called How to Read Music, which I think perfectly presents the language of music in a way that everyone can understand. MO: When you’re at home, do you have a set practice schedule? Please offer some practice suggestions for the beginning and advancing bassist? IS: I do practice a lot and I think I’ll always keep doing so. The way I practice has been changing through the years. I remember studying 17 hours a day for the first two years, then I started doing gigs and I didn’t have as much time to study. So, gradually I began to study less, but, I still practice a minimum of 4 hours every day on average. At the beginning I had a very tight practice schedule with every topic at its specific time. Now, I study what I need. I do it freely, as I feel it. It varies a lot from day to day and from time to time. I think every stage of the learning process has its own practice routine. I think the stage where I’m now needs different things to be learned and in different ways than at the beginning. MO: What suggestions would you give a bassist on his quest for tone? For example, basses, strings, amps and processors. IS: I’ve done the whole trip in relation to that! I’ve had so many instruments and so many amps and effect processors that I don’t even remember all of them. Eventually I came to the conclusion that I only needed a very simple set-up to achieve the sound I want. Just a bass with no knobs, no preamp, no pedals — just a power amp. That’s the way I feel I am able to achieve my very own sound. I’ve been playing like that for almost 15 years. I think that ideally every student has to take the full ride in order to arrive at a personal conclusion. MO: Speak to us of your approach to the recording studio and share with us the percentage of preparedness in relation to improvisation. Contrast this to your approach to a live performance. IS: It depends really on the gig. You have certain studio recordings where you are given a lot of freedom and others where you are not. The same happens in a live concert context when, depending on the music style or the musical project itself, you are going to be given a lot of freedom and space to improvise and in other situations you will have to stick to the arrangement exactly as it was written. If you ask me for my personal preference, I feel comfortable with a mix of 30% fixed and 70% improvisation. MO: After all the accolades you have received, and incredible playing experiences you have had, what advice would you give beginning musicians playing the bass? IS: I would just ask them why are they playing music and why are they playing the bass. In my opinion, the most important thing is to realize that the possibilities of becoming rich and famous are very slim in this field. However, if you do achieve that, you probably will have to give up a little bit and play commercial music. Also, if all you want to do is attract girls, then there are many activities that will get the same result: like sports, being a lawyer or things like that. Bottom line, I’d tell the beginning bassist that it’s very important to find out if what they are doing is being done for the right reasons — not for reasons that they probably don’t even realize. MO: Do you ever go to guitar/bass shows? IS: I’m really lucky to have been invited to perform at almost all of the most important bass shows in the world and it has been great. I’ve been able to meet amazing people, truly amazing musicians, and have learned a lot from these experiences. MO: What is your vision of music and technology in the future? IS: In relation with my instrument, I said 15 years ago that the Bass and the Guitar were merging, that eventually they will be just one instrument that will be played either as a bass or as a guitar. This is happening right now! Every day we see basses with more strings, playing more chords and melodies. And at the same time, we see guitars with more strings added to the low register and playing more bass lines. In relation to technology, in the overall sense of the term, I think the biggest task is being able to identify when it becomes an end in itself. As far as I’m concerned, technology is a means to an end which is music and ultimately Art. I feel that the biggest problem of our time is the obscene excess of technology. MO: Just for fun, if you were ever to record a collection of bass cover tunes, what songs would be included? IS: That’s a great question! I think I would choose some tunes from the Pick Hits Live album by John Scofield, Face First by Tribal Tech, The Sun Don’t Lie by Marcus Miller and of course tunes from The Chick Corea Elektric Band and Weather Report. MO: What are some of your upcoming projects? IS: For the second part of 2014 I have a lot of activities. I’ll be playing at Summer NAMM 2014 in Nashville for my sponsors. Then I’m heading to Germany for the recording of my debut solo album and a performance at the Warwick Bass Camp. I also have upcoming concerts in Houston, Detroit, Shanghai, Colombia and Paraguay in the works. MO: You are called the Pioneer of the 8-String Bass. Tell us more about this, for example, what led you to the extended range bass, who makes it, how is it tuned, etc. IS: I am very happy that the bass community and the bass critics call me that. I take it with a lot of humbleness. Since 1999 I’ve dedicated my heart, my brain, and my soul to the playing and development of the 8 String Bass exclusively. My 8 String Bass is tuned from low to high F# B E A D G C F. The standard 4 string bass is right in the middle. I don’t go with an extra string below the 8th string F#= 23.125 Hz, because that is the last audible open string you can have if you want to keep the standard bass tuning in descending 4ths. One string lower would be a C# 17.32 Hz, and that is below the normal range of hearing. Regarding going higher, my 1st string is F=174.61Hz. The reasons for this is quite simple. I can play the sound of the 24th fret on a 4 string bass on the 5th fret of my 8-string bass where it is comfortable to play. Any string higher than my F string would have to be unwound and would lose the timbre of the bass sound. My 8 String basses are known everywhere as Octavius. Octavius 1.0 was made in 1999 by luthier Alfonso Iturra, then in 2006, Octavius 2.0 was made by luthier Claudio Gonzalez. Octavius 3.0, called the Igor Saavedra Signature RBHB, is made by the great Spanish luthier Oscar Prat and is now available to all. MO: Anything else you would like to add? IS: First of all I want to thank Mike Overly for making this interview possible. 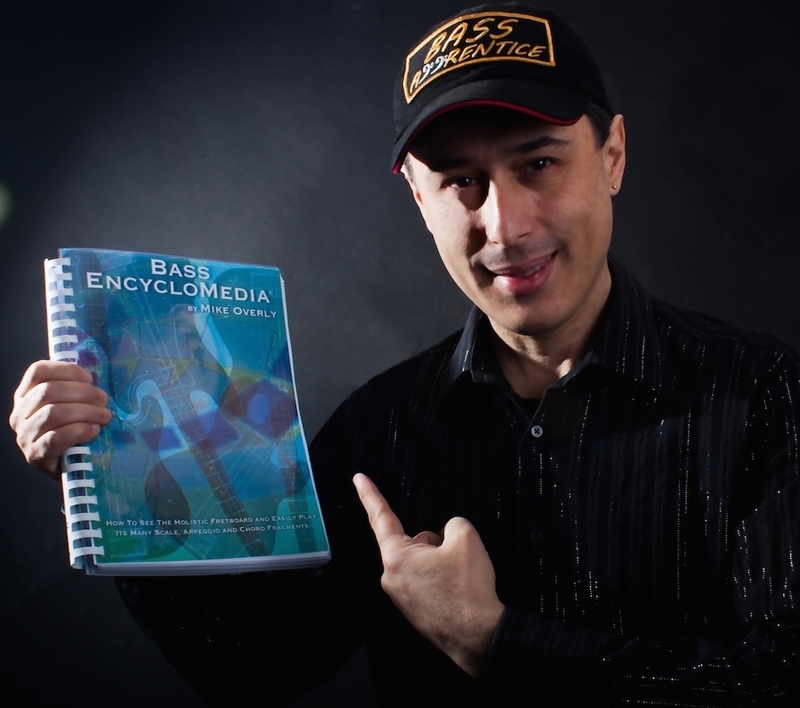 Mike is a GRAMMY® Nominated Music Educator and I fully endorse his Bass EncycloMedia which I think is really great! Secondly, I want to thank Guitar Digest for having me here and recognizing that the bass guitar is an important member of the guitar family. And finally, I would like to encourage young musicians to think of themselves as more than just rock stars and circus performers, gear owners and instrument collectors, but as Real Artists. Finding a bass player is quite easy, but finding a real bass artist within this music jungle is perhaps the hardest task — maybe even harder than finding a rose in the desert. You are currently browsing the archives for the Bass History category.